Recipes using Tarragon in the ingredients. 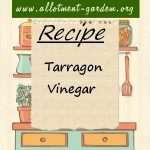 Recipe for Tarragon Vinegar. Adds interest to salad dressings and can be used in stews, soups, sauces etc. Herb Vinegars make a lovely gift.